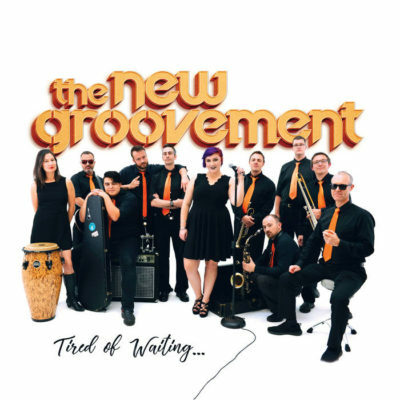 Tired of Waiting is the fresh new studio EP by Victoria-based funk/jazz/ hip-hop fusion band The New Groovement. The talent it takes to compose music like this is immeasurable. The talent it takes to perform this stuff is otherworldly and wow, these guys (and gal) have got it. The production on this release is so clean with the horns being a total stand-out here. The horn section on this release is so well written, recorded and executed and of course are super clean and bright. The incredible bass is right there with you in your soul along for the ride and the drums and percussion are crazy solid, inventive, super clear and mega funky. The guitar writing on this record is so lovingly comprised of the jazzy licks and 70s-esque fretwork that is so unfortunately uncommon in this day and age. To top it all off, we have frontwoman Steph Wisla’s powerhouse vocals. She stands her ground and tears the roof off of the lyrical topics presented here and her jack-of-all-trades pipes are perfectly at home within this band; from the soft sections on Hooked on You, to the belt-it-out lines found on tracks like Waiting. She’s the incredibly talented cherry on top of the pie that is this JUNO Award-destined group of musicians known as The New Groovement. The instrumental breaks and pauses in the music, the solos and those explosive full-band jams just get you in the right mood for a good time. As I write this, the rap section of Little Black Skirt is soaring through my studio monitor speakers. The flow of this section and of course the entire song is immensely smooth and the rest of this EP follows suit. This band deserves your support and your ears deserve to listen to this release. You can purchase this album for $4.95 on iTunes and if you would like to support the band even further than 5 bucks, you can choose to pay as much as you want ($4.95 or more) for the EP on Bandcamp. I highly recommend this release!